BizPlus is a multi-purpose business theme powered by WordPress suitable for all sorts of corporate houses as it allows you to create multiple layouts.This is an advanced version of our Popular theme BizLight theme. The theme is easily customizable and even someone who is not tech savvy can manage the content and options in a very convenient way. In addition to the common features, BizPlus comes with advanced features like, responsive canvas menu, theme customizer options, custom menu, drag & drop widgets etc. 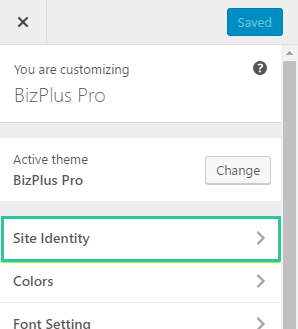 Also, with its pixel perfect resolution, the theme appears great in all devices making BizPlus one of the best choices when it comes to business themes. Select ‘bizplus.zip’ and click ‘Install Now’. Unzip bizplus.zip to your Desktop. Using an FTP client to access your host web server, go to wp-content > themes and upload your new copy of your BizPlus theme. The theme will now be activated. You can set up the front page in two different formats: – a blog page or a static front page. A blog page is a usual inner page, while a static front page has special display options. Select the page required for static front page. After this, your current display will change to the display similar to that of theme demo. Once you have the static front page set up, a number of sections appear on the front page, all of which can be modified from the Customizer. The general customizer includes various options. They do bring changes in the front page as well. On checking the option ‘Enable Feature Slider’ the slider will appear on the front page. When the option is not checked, it means that the slider will be hidden. Now you can select the number of sliders you want. Go to, Settings Options >> Select Slider From. Now select page or category as per your need. Go to Customize >> Home/Front Main Slider >> Select Slider From. Select page here if you want to display pages. If you do not want pages but posts in the main slider, select category. Please list all the required posts under a certain category first. Now, you can select specific pages for each slider. 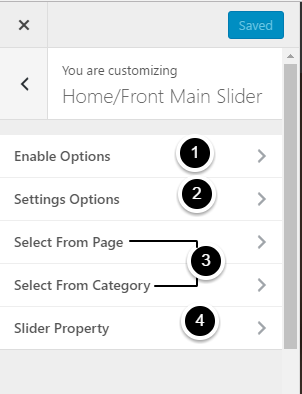 Go to Customize > Home/Front Main Slider > Select from Category. Now, select the category that contains the posts you want to display. To select number of words appearing per slider, slider mode, slider transition and pause duration or to enable/disable arrow, pager, auto play, title and caption. 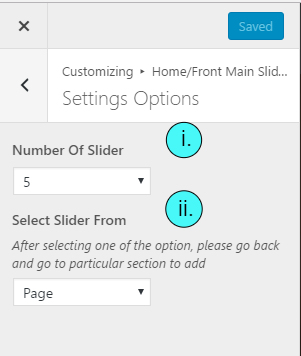 Go to Customizer > Home/Front Main Slider > Slider Property and make the necessary changes. On checking the option ‘Enable About Section‘ the section will appear on the front page. When the option is not checked, it means that the section will be hidden. First, create a new page with a suitable title and include the details about your company in the page. Then, Go to Section Settings > Select page for About Section. Now, you can select the required page. Now, you can select the number of words you want to display. Go to Section Settings > About Section Button Text. You can edit the text there. On checking the option ‘Enable Service‘ the section will appear on the front page. When the option is not checked, it means that the section will be hidden. On checking the option ‘Enable Service Thumbnail‘, the service icon will be replaced by the thumbnail. 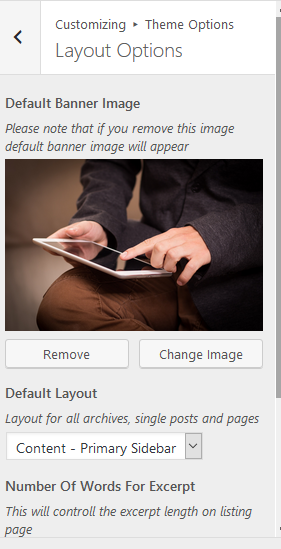 Thumbnail image is the featured image of the page or post selected. Go to Customizer > Home/Front Service Section > Service Icons. You can select specific icon for each service. A link with awesome icon collection is provided therein. Go to Service Options and edit the main title and subtitle. Go to Service Options > Select Service From. Now, select page or category as per your need. Go to Service Options > Number of service/s. Now, you can select the required number of service/s you want to display. Go to Service Options > Number of Words in Single Column Content. Now, you can set the number of words that appears in the services in the front page. On checking this option, you will be able to link specific services to their original page. Go to Service Options > Check the ‘Enable Link in Single Column‘ option. Go to Service Options > Browse All Button Text. Now, you can enter the required URL in the box. If you do not want pages but posts in the services, select category. 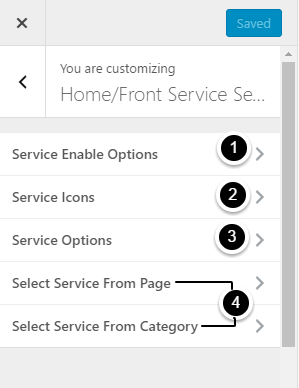 Go to Customizer > Home/Front Service Section > Select Service from Category. 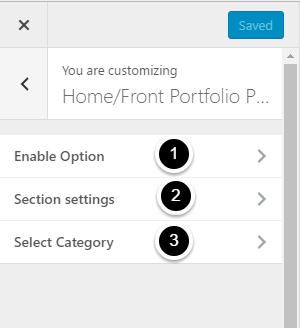 On checking the option ‘Enable Portfolio‘ the section will appear on the front page. When the option is not checked, it means that the section will be hidden. Go to ‘Sections Settings‘ and edit the main title and subtitle. 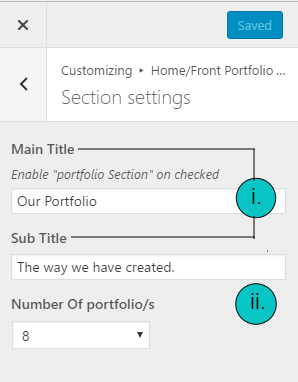 Here, you can select the number of portfolios you want to display. Once, you have the categories ready with at least one post in each of the category you can select it for the portfolio. Here, you can select the categories you want to display. On checking the option ‘Enable Testimonial‘ the section will appear on the front page. When the option is not checked, it means that the section will be hidden. Go to ‘Settings Options‘ and edit the main title and subtitle. Go to Settings Options > Background for Testimonial Section. You can upload the required image there. Go to Settings Options > Number of Testimonial/s. Now, you can select the number you need. Go to Settings Options > Single Testimonial-Number of words. There, you can set the number of words appearing per testimonial in the front page. Go to, Settings Options > Select Testimonial From. Go to Settings Options and select within. 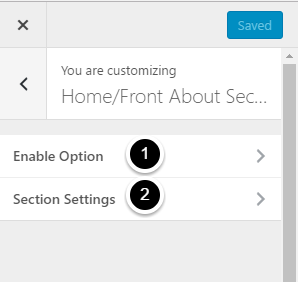 Go to Customizer > Home/Front Testimonial Section > Select Slider From. 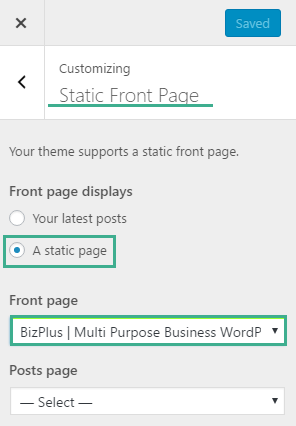 If you do not want pages but posts in the main slider, select category.Please list all the required posts under a certain category first.Also, make sure you use the name of your client as the page title or post title. 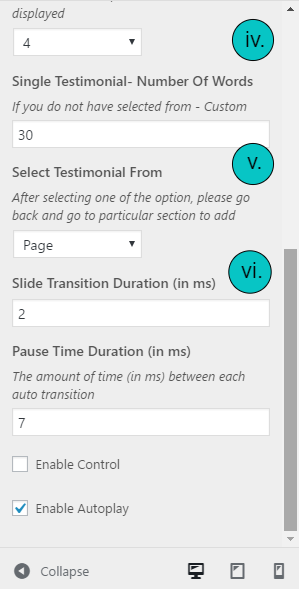 Now, you can select specific pages for each slider in the testimonial section. 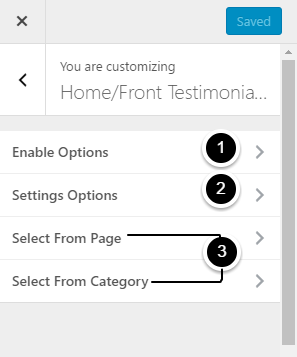 Go to Customizer > Home/Front Testimonial Section > Select from Category. Go to Team Options and edit the main title and subtitle. Go to Team Options > Select Team From. Go to Team Options > Number of Team/s. Now, you can select the required number of team/s you want to display. On checking this option, you will be able to link specific team member to the team member’s page. Go to Team Options > Check the ‘Enable Link in Single Column‘ option. Go to Team Options > Browse All Button Text. Go to Team Options > Browse All Button Link. First, Go to Customizer > Team Options > Select Team From. If you do not want pages but posts in the team, select category. Go to Customizer > Select team from Category. The blog section will be updated automatically as you publish new posts. You can still edit various settings. On checking the option ‘Enable Blog‘ the section will appear on the front page. When the option is not checked, it means that the section will be hidden. Go to Customizer > Home Blog Options > Main Title. You can edit the main title here. 3.Determining number of words appearing in sticky post. Go to Customize > Home Blog Options > Number of words for sticky post. Here, you will be able to set number of words appearing for the sticky post in the front page. 4. Determining number of blogs that appear in the front page. Go to Customizer > Home Blog Options > Number of words for blog post. Here, you can select the number of words that appear for each blog post in the home page. Go to Customizer > Home Blog Options > Single Item read more text. Go to Customizer > Home Blog Options > Enable Button. 8. Selecting which page ‘Browse All Button’ leads to. Go to Customizer > Home Blog Options > Enter URL to redirect. Go to Customizer > Home Blog Options > Browse All Button Text. 10. Selecting blog from category. You can also display posts from a single category in the blog section. For this, Go to Customize > Home Blog Options > Select Category For Blog. And, select the category you wish to display. You will be able to add client logo from there. We will see contact form after installing Contact form-7 plugin. you have to add contact form short-code there. To get same contact form structure as in demo site, default contact form code should be replace by following code. 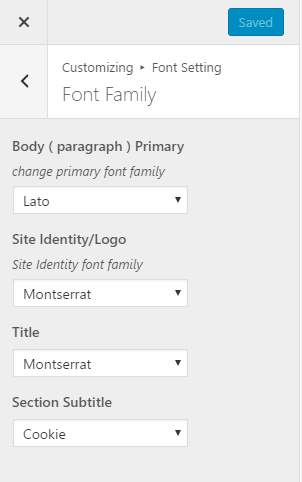 Now choose the specific font family for each of the given sections. Once, the preview is fine, save it. Go to Customizer > Colors > Basic Color Options. 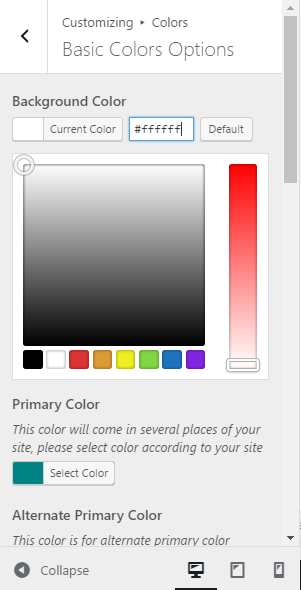 Now, you will be able to change the color options. Once, the preview is fine you can save and publish it. On checking the ‘Reset’ option and saving it the color options will change to default colors of the theme. Go to Customizer > Background image. You can upload a picture there. Once, you have the picture selected you can make various changes regarding how it is displayed. Save the changes once you are fine with the preview. From Menus, click ‘Add a menu‘ button, you will be able to create a menu here. Once, you have created the menu, you can further add items to the menu. 2. 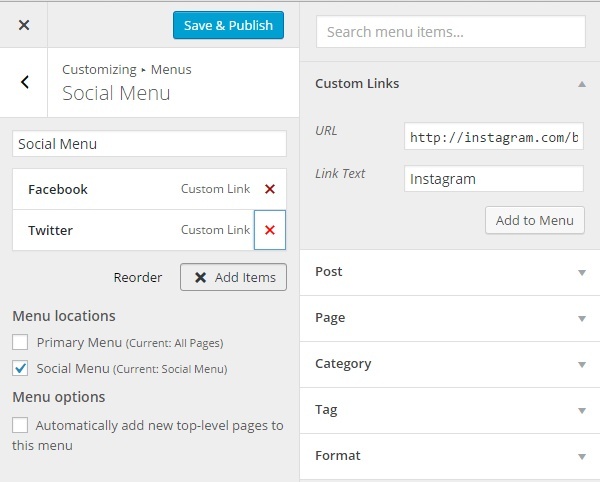 Creating a Social Menu. 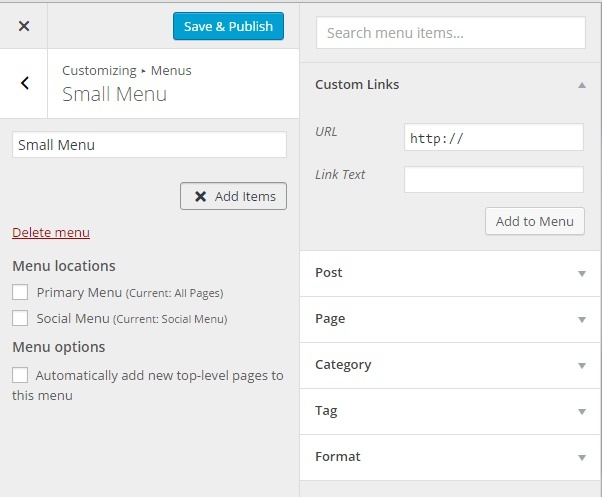 From, Menus create a menu (E.g. “Social menu”) and assign its location to Social Menu. Now, once you add custom links and social media URLs in each of the links, you will get the social icon in the Social Menu. 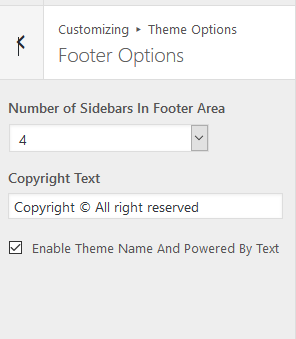 From Customize section, go to Theme Option > Footer.